Walsine Pierce: PRESIDENT OBAMA, AN INSULT TO THE COUNTRY: Whats With All The Bowing? PRESIDENT OBAMA, AN INSULT TO THE COUNTRY: Whats With All The Bowing? AND YOUR BELIEF WILL CREATE THE FACT"
EVERY MAN DIES, NOT EVERY MAN LIVES! 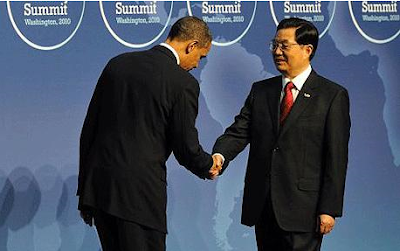 At the 2010 Economic Summit in Wasington, DC, bowing to Chinese President Hu's intransigence, President Obama is announcing that he will let Hu continue to deindustrialize the United States and that he will let totalitarianism replace democracy and the free market as the world's dominant social and economic system. President Hu is refusing to adjust China's currency to market levels so that he can continue to steal American manufacturing industries. He is shipping gasoline as part of his continuing support to the world's most repressive regimes in North Korea, Burma, Sudan and Iran. He opposed America in the United Nations effort to stop the killing in Syria. President Obama bowed deeply to the Saudi Prince, who, incidently, assuming the role of the superior, did not return the bow. The Saudi's supply their children's schools with text books that teach that all infidels must be murdered--THAT'S US FOLKS--and that women are less than human are to be used. When informed that the Japanese Emperor wanted to meet with General Douglas MacArthur, who was the supreme leader in Japan following WWII, old "Dug Out Doug" said "let him make an appointment", or words to that effect. Very importantly, MacArthur let the Japanese "GOD" come to him. When introduced the Emperor bowed, MacArthur did not. Americans do not bow. In the Orient where bowing is a custom, and I do not know that it is a bad custom, bows may be exchanged many, many times except where homage is being paid. In that case, a bow is not returned. ﻿America has no greater friends than our cousins in the United Kingdom. (Oh Yes! You are right! Obama's cousins do live in a Muslim country in Africa). When the President and his wife arrived at the Buckingham Palace for a two day state visit, they were met with a 41 gun salute. 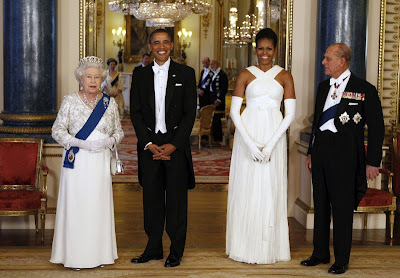 WHEN HE WAS INTRODUCED TO THE QUEEN OF ENGLAND, PRESIDENT OBAMA DID NOT BOW, SLIGHTLY NODDING HIS HEAD INSTEAD! This is, of course, just what he should have done, but make the comparison. Although I was tempted to grovel at the feet of the beautiful English Princess! AND, SCRATCH WHERE IT ITCHES!